How to find good content to share with our audiences. 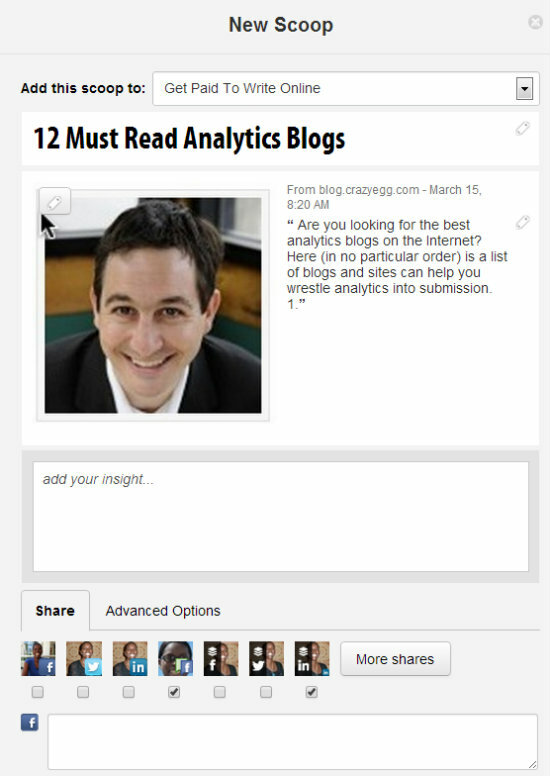 Which tools to use to share that content. How to figure out our reach when we share it. Let’s see how the free versions compare for setup, content discovery, content sharing and social analytics. Swayy is still invite-only (update: the public beta is now open) but, presuming you have an invite, all you have to do to get started is login with one of your social media accounts—Facebook, Twitter or LinkedIn. That’s pretty much it in terms of setup, though you can go to the settings (click the gear icon) and add your name, select email options and (if you’re a Pro user) your Bit.ly account. 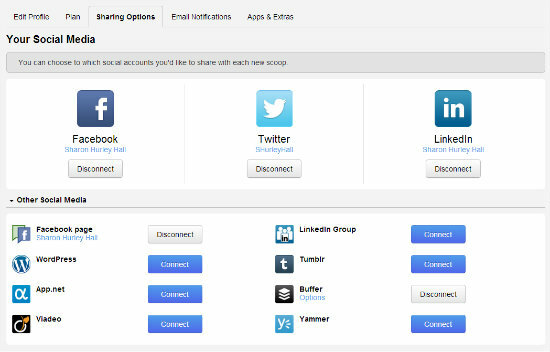 Scoop.it allows you to use the same social sites to login or you can use an email address and password. Setup takes a little longer. That’s because unlike Swayy, which is more of a content discovery tool, Scoop.it creates an online magazine, so there’s more to do, such as adding your other social media accounts for sharing and giving your creation a title and description. Winner: Swayy for ease of use, but that doesn’t tell the whole story, so don’t count Scoop.it out. With Swayy, still in the settings interface, you need to pick your topics. 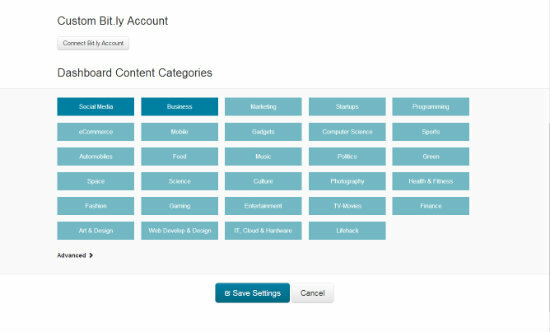 At the time of writing, Swayy had 29 content categories—all you have to do is click a button to select and it does the rest, finding suitable content for sharing in those categories. Save your settings and return to your dashboard to see the content the app has found for you. Click on the title to read the post before sharing. In my experience, browsing the Swayy dashboard always throws up articles I’ve missed that I’m interested in, so it works very well as a content discovery tool. If a post isn’t relevant click the x (visible when you hover) to remove it. Swayy also sends a daily email update of shareable content, though I’ve found that clicking on a title just takes you to the main dashboard instead of the article—that’s annoying and I hope the developers will fix it. In comparison, Scoop.it can be noisy. You can add content via keyword search from a number of sources (such as Google Blog Search, YouTube and more), as well as any RSS feed. The setup process encourages you to keep adding keywords and sources, but I’ve found that if you add too many, you end up with way too much content to look through, visible in the ‘suggested content’ interface. 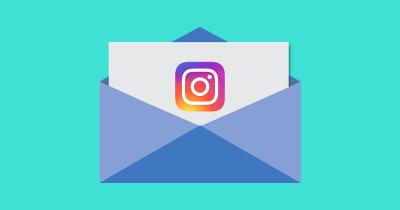 People can also suggest content to you, and you get notifications either on-site or by email, depending on your preferences. I have discovered great content this way, but it’s harder. Winner: it’s a tie. Swayy has a cleaner interface, but Scoop.it has more potential sources. 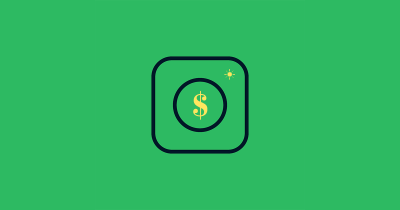 Since Swayy only works with two networks in the free account, that’s all you can share to. 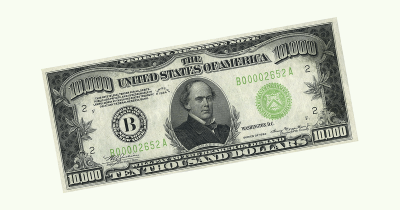 (The paid pro versions say you can have unlimited accounts, though there’s no indication of what these are.) Click the share button and a box pops up. In my account, Twitter is selected by default and it comes up with suggested users to mention and suggested hashtags, a feature I find very useful. The LinkedIn share box does neither of these, but I often use the same hashtags, since LinkedIn now supports them. You can also choose whether to share immediately or in one or two hours (other time periods are a pro feature). This works well so you can stagger your sharing. As previously mentioned, in the setup phase for Scoop.it you are encouraged to add all your social media accounts to facilitate sharing. If you have done this, you can share any piece of content to multiple accounts with a couple of clicks—and you can customize each update and add your comments too. Scoop.it works with all the major social networks, either natively, via a button from the provider or (its ace in the hole) via Buffer. The integration with Buffer means that Scoop.it’s scheduling services far outweigh those of Swayy. Winner: Scoop.it (and the Scoop.it/Buffer combo), hands down! Once you have started sharing content with Swayy, you get analytics. 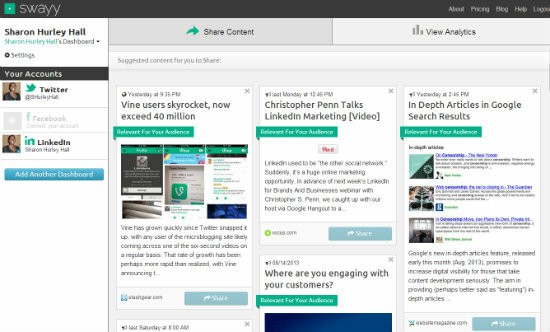 In the sharing dashboard, you can see your most important content sources and types and trending keywords. There’s even more detail when you click on “view analytics”. That’s where you can see how many links you’ve shared with Swayy and what kind of response you got overall. You can also look at individual posts and see stats for those. While you have to upgrade for more depth, for a free product this is pretty impressive. I also like that Swayy tracks the links I share manually on Twitter, though it’s notable that these don’t have the same sharing results as the ones from Swayy. Scoop.it’s free analytics are minimal in comparison, but different. In the main dashboard you can get a snapshot of total views and views of the day, while clicking on the views tab for each collection brings you more stats on visitors, scoops and reactions. With Scoop.it you can easily get an idea of how engagement is progressing, though you will have to look at individual scoops to see what is happening with them, which makes things a little bit harder. So which one wins? In reading this, you might think that it’s Swayy, but having used them both, I’m still not sure. Scoop.it’s been one of my favorite content curation and social sharing tools for years, but the analytics in the free version aren’t up to snuff. 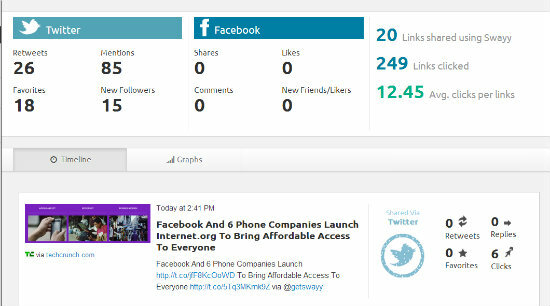 In comparison, Swayy has an uncluttered interface and decent free analytics. 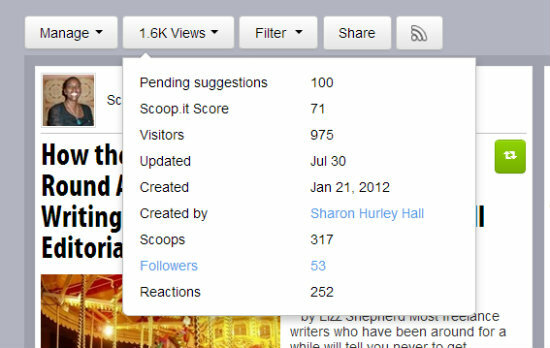 Scoop.it wins on the sheer number of places you can share content to, but I love the hashtag and mention suggestions in Swayy. better scheduling, more dashboards, more social networks and deeper analytics (Swayy). more sharing options, more branding options, more in-depth analytics (Scoop.it).